Best of 2013: Top 5 Gigs. – music waffle. 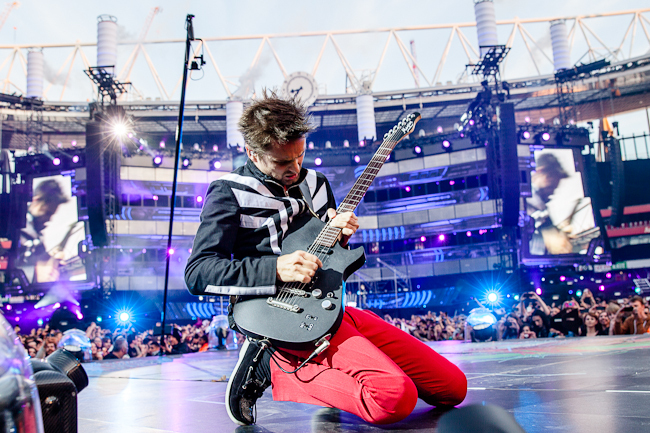 1) Muse, Emirates Stadium, May 26th. Despite needing hiking equipment and oxygen tanks to climb my way up never ending concrete steps, despite being faced with the grimmest stadium food I’ve ever witnessed, despite being told by Dizzee Rascal to ” Effing do this and effing do that”, this was undoubtably a wonderful live experience. Because these boys know how to put on a grand show. It was a visual variety of staging and delivery, and you simply never knew where the next grand piano was going to pop up. There were eccentric moments, floating light bulbs, and walking robots, but the depth of back catalogue and big rock numbers meant the sheer weight of material drove the show, and the band optimised their considerable anthemic qualities. 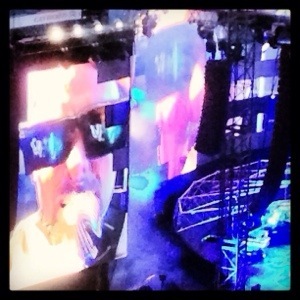 Muse are big and beautiful. 2) Kaiser Chiefs, Newmarket Race Course, August 2nd. Three words describe this event – fun, fun and fun. A perfect evening weather wise, frock wise, and betting wise (I was quids in) before the music even started, and let’s face it, there’s no way a cheery guy like Ricky Wilson will put a downer on you. Full of energy, he strides around and drags the audience along with his brand of hyperactive performance. He does his customary clamber up the scaffolding, security guards twitching below, as I predict a riot belts out. I found myself grinning all evening, yelling my head off to every tune and just feeling pretty grateful that there are events like this to simply make you feel the joy of life. 3) Matt Cardle, Union Chapel, May 2nd. A stunning venue and a stunning vocalist, the intimate set up allowed Matt to chat in his personable way about the songs on his set list put together as his “musical journey” and lay bare the sheer talent he possesses. If I’m 100% honest there were a few too many covers for me, from a man who had 3 albums of tunes under his belt before he was a twinkle in Simon Cowell’s eye, or a contributor to his bank balance, but somehow they feel like new songs because he “mattifies” them so brilliantly. The voice is addictive, I simply can’t go a day without plugging myself in to it, and would probably pay money for a Cardle version of Baa Baa Black Sheep, but the upcoming Porcelain Tour with full band will give more scope to display the full range of material in his locker. People might be surprised to know what a rocker he can be. Live music to look forward to in 2014: Elbow, The Porcelain Tour and Kasabian.